Workshop is open to all levels. Whether you are a novice just learning or a professional needing advanced problem solving, Victoria�s individualized instruction will address needs at your level and push you to the next step in your personal development. Hotel Nissos Thira may also be used for all enrollment received after August 5, 2011.
the joy of learning and gaining plein air painting skills and confidence with the expert instruction of a professional instructor and the camaraderie of a small group of learners. 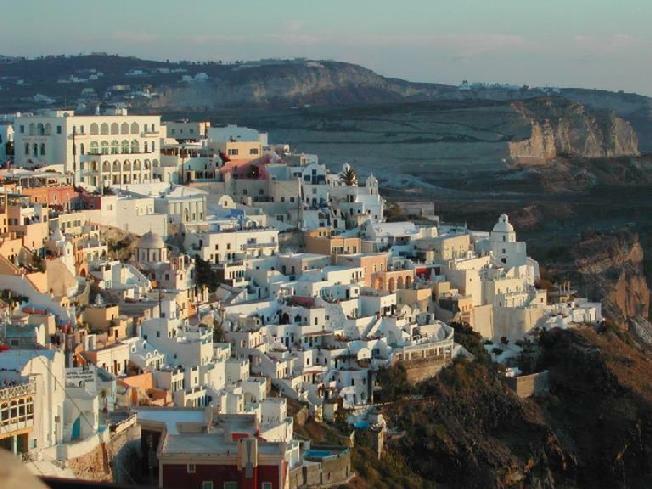 During the week we will visit the towns and villages of Fira and Oia (pronounced Eee-ah) and the local museum featuring wall paintings from the ancient city of Akrotiri. We will also take a day cruise to explore the inner islands, with optional visits to hot springs, the volcano, as well as the island of Thirasia. 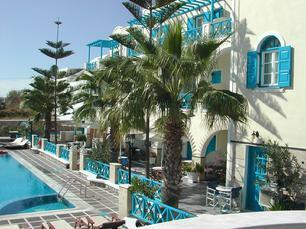 US$3740.00 per person single occupancy**. 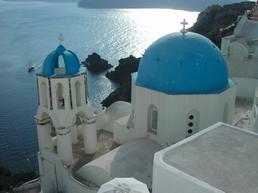 Caldera cliffside Hotel Loucas at additional cost. CANVAS or LINEN PANELS: 14 panels� (7)-8x10, (7) � 6 x 8 panels. If you are more experienced you can use 9 x 12 and 12 x 16 (no larger). Fredrix Canvas makes nice linen and canvas panels: see www.jerrysartarama.com, (800) 827-8478. For a high quality custom panel that is very lightweight order #66 linen to be mounted on museum board visit: www.newtraditionsartpanels.com. (801) 732-0208. WET PANEL HOLDER: Holds up to 6, 8x10 or 6x8 wet panels � visit www.raymarart.com. (888) 809-3314. Easel: � box French Easel OR one that is called a �pochade box� (it attaches to a camera tripod) visit www.openboxm.com, (800) 473-8098. (I use an 10� x 12� pochade). OR check Judson�s Art outfitters www.judsonspleinair.com (866) 762-4233 for catalog. Workshop will provide: paper towels and turpenoid. Suggested Book: �Filling your Paintings with Color and Light� by Kevin McPherson. Please bring an array of newer brushes. Pointed sables, #2, 4, 8, 14. Flat wash brushes, ��, 1� & 1 �� (Langnickel, Nake or Japanese are fine). No stiff or worn out brushes. Easel: called a pochade box that attaches to a camera tripod visit www.openboxm.com, (800) 473-8098. (I use a 10� x 12�pochade, don�t get the carrying case).